Making sure your baby gets the proper nutrition is an important concern, and baby formulas such as Similac and Enfamil are often under scrutiny. If you have ever wanted to get more information about these specific brands, then this is the place to get it. Similac is a baby formula that contains purified whey from cow's milk and casein, which is its primary source of protein. 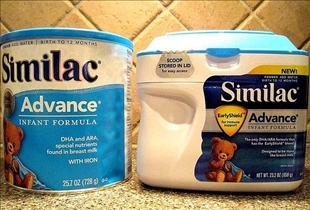 Similac also contains a vegetable oil blend that serves as the source of fat, lactose that provides carbohydrates, vitamins, minerals, and other ingredients. Enfamil is a baby formula manufactured by Mead Johnson. The company is distinguished by its use of Beatrix Potter's Peter Rabbit character, a branding that began in 1972. Similac was introduced by Alfred Bosworth in the late 1920s as a product that was supposedly "similar to lactation", hence the name. Although several other baby formulas were introduced into the market over the next few years, it wasn't until the 1950s that baby formulas began to offer significant market competition against evaporated milk products. Enfamil was introduced in the late 1950s by Mead Johnson, the company founded by Edward Mead Johnson in 1905. The company’s first product was Enfamil R, which was Mead Johnson’s first infant formula designed to replicate the nutritional content of human milk. The company has since produced a wide range of different Enfamil products. The histories of the two companies are actually somewhat intertwined, with Similac undergoing reformulation and concentration in 1951, with Mead Johnson launching Enfamil in 1959. Both products were seen as being partly responsible for the increasing popularity of infant formulas. By the early 1960s, such formulas were more common than evaporated milk formulas, a product that largely fell out of favor by the 1970s. By that time, as many as 75% of all babies in the United States were given commercially produced baby formulas. Similac and Enfamil both have their adherents and detractors, and both sides do have their points. One drawback of Enfamil is that it is made with palm olein oil. Similac on the other hand does not contain this ingredient. One study has suggested that baby formulas that blend fat with palm olein oil may cause less frequent and firmer stools, which may results in constipation. Similac also claims that its product’s calcium content is a lot easier to absorb than Enfamil’s. To its credit, Enfamil contains higher DHA and AHA levels than Similac, with Enfamil containing 17mg compared to Similac’s 11mg. Enfamil is also quite a bit cheaper than Similac. Which baby formula do moms prefer?